MAXIM’s Chalk Line Soft features the same construction as our standard Chalk Line gym rope but with a slightly looser sheath weave. 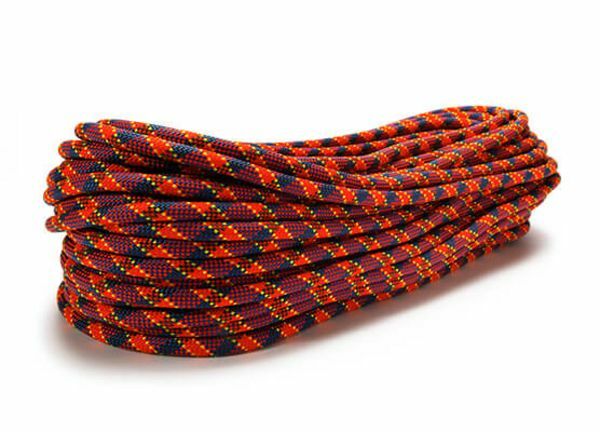 This construction gives the indoor climbing rope a soft touch and increased knotability. Chalk Line Soft is one of the longest lasting gym ropes on the market. The general construction of MAXIM’s Chalk Line and Chalk Line Soft are similar. But while the regular Chalk Line comes with very compact braiding, Chalk Line soft features a looser sheath weave. This construction adds more flexibility, better knotability and soft touch to this indoor gym climbing rope. Chalk Line Soft is among the longest lasting gym rope on the market and should not be missing the rope portfolio of your climbing gym. No matter if you have a small community gym, an outdoor climbing wall or a nationally branded gym, the Chalk Line Soft is the right choice for you because it reduces down time, rope setting and annual rope costs. The Chalk Line Soft can easily cope with belays through a variety of devices as well as the constant falls of the daily gym routine without losing its round shape and its soft hand. Our proprietary Str8 Jacket construction allows the Chalk Line and the Chalk Line Soft to hold its shape, keeps balance between cover and core and eliminates sheath slippage. For this reason, flat spots are reduced and the overall performance of the climbing rope is maintained. Chalk Line Soft is available in 10.2mm for top rope and lead ropes and features our Endura dry treatment in the core yarns for added safety also on outdoor climbing walls.